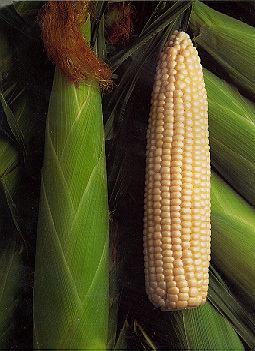 BALTIMORE(AP)-For years, Maryland corn had only one member in its royal family: the Silver Queen. The corn's sweet, white kernels could make the mouth of any Marylander water.But new selectively breed strains of corn are being grown by more farmers and grabbing the palates of more people. The Silver Queen no longer rules the maize world. "She's been dethroned. She's the queen in name only," said Tony Evans, a spokesman for the state Department of Agriculture. For more than 20 years, Silver Queen was the most popular strain of corn in Maryland, Mr. Evans said. But for the past decade, new varieties,- such as Argent and White Magic- have been grown by Maryland farmers. The new versions tasted sweeter than the old Silver Queen. But roadside stands and grocery stores sometimes still advertise the new corns as Silver Queen to catch customers attached to the moniker. "There was a lot of presumptive, would-be royalty out there," Mr. Evans said. "That's because the Silver Queen name was stronger than the product. But now there are so many other, better varieties of sweet corn available to the consumer." The state agriculture department said 75 million pounds of corn were grown in Maryland last year, but they don't keep any statistics on the varieties. Jim Lewis, an agricultural extention agent in Caroline county, said farmers in the Eastern Shore county grow very little, if any Silver Queen. "I can't tell you off the top of my head a single grower in the county growing it," he says. "If one told me he was, he'd have to produce the bag of seed for me to believe it. And I'd be so skeptical it'd have to be this year's bag." It's been three years since Bill Buchmans' Carroll County farm has grown Silver Queen. He switched to a sweet corn variety called 81W. My customers keep telling me, "You've got to grow Silver Queen. That's what the public knows," Mr. Buchman said, "And I keep telling them, 'Silver Queen's a thing of the past, Silver Queen is dead.'" It's hard to tell if Maryland's sweet corn consumption is more than other states, Mr. Evans said. "But we eat an awful lot of it because we have a long season, from late June to early October and we just love it with out crabs."